Monsters are scary. Nature is scary. Other people are scary. The Falconers: Moonlight shuffles a royal flush of menaces into a supernatural thriller set in 19h century colonial New Zealand. This visual novel, by indie developer Bionic Penguin, delivers more than a sublime self-contained story. 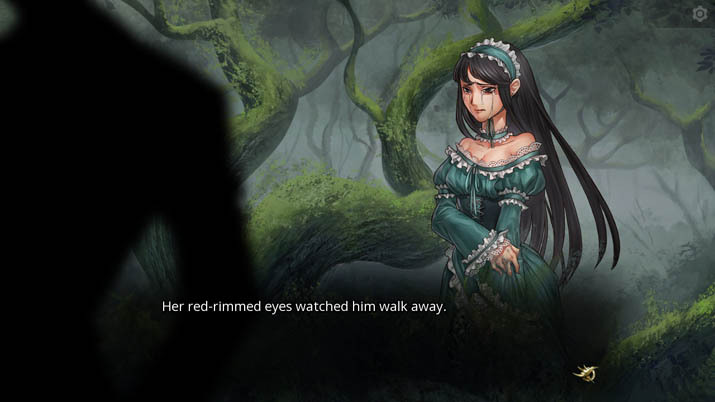 It also debuts the world of The Falconers, “an IP developed by the Lead Narrative Designer of Path of Exile, Edwin McRae, that mixes historical fact with supernatural thriller and fantasy fiction. Its stories are based in the 19th Century colonies of the European empires.”  In other words, if we're very, very good, we might get to play more titles like Moonlight. Bionic Penguin has invested deeply enough in this title to build a franchise around it, and the effort shows. As the protagonist Cassandra Winter, you know everything about your enemy up front. You hunt a Culler: a native monster of the frontier. Cullers attack settlers who bring their “civilization” to new lands. If that sounds like a critique of colonialism to you, take a gold star. It is. It's a folklore-rich, Victorian-era Monster Hunter International, and if that premise intrigues you even a bit, buy Moonlight immediately. Each element of this title works with the others to create narrative momentum and tension, but its sound in particular caught my attention. Early in the story, you venture into the forest to find your Culler monster, and as you get closer, ambient sound diminishes. Your character notes that the birds fell silent. It's a subtle hint that changes gameplay for players who take heed: pay attention to the sound effects. You can tell by listening whether there's a predator about, and how careful you should be with your words. You don't want to share Falconer secrets when it's quiet. Monsters might be listening in. The best horror stories, of course, also make us fear ourselves. Moonlight delivers on that front by taking advantage of its visual novel format. As the player, you make choices about how to proceed with your investigation. These choices deal with a common theme: trust. The narrative frames every decision you face in terms of building and breaking trust, and trust isn't a simple matter. You hunt giant insectoid monsters, but you also track the kind that hide: a Culler that takes human form and insinuates itself into a community, manipulating settlers into killing each other. Your protagonist is keenly aware of opportunities for manipulation, and it's up to you how much she ends up resembling her enemy. You may decide that it's not right to lie to someone about your past, about why you became a monster hunter. It's not right, you may think, to tell my heart-wrenching cover story, to manipulate this person — just like a Culler would — to gain an advantage. On the surface of such a choice, you're dealing with the person decently and building trust. Hopefully, this will lead to the person cooperating with you in your investigation. However, you're also revealing information any shape-shifting monster listening in can use against you. Even as you build one kind of trust, you're breaking down another: the trust the people of Moonlight place in you to keep them safe and eliminate the predator in their midst. You're a predator of predators, in some ways no different than the Cullers. While you track audio cues and indulge in paranoia about the presence of Cullers, you also hear the resonant strings of an orchestra. I especially dig the forceful cello in Moonlight's soundtrack. 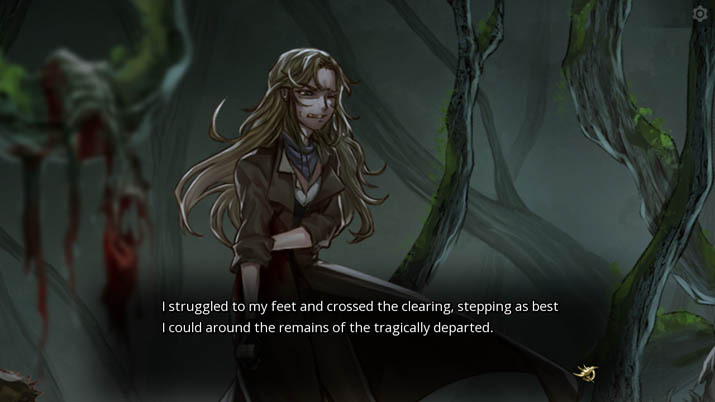 Tracks and ambient sounds all trigger and cut off to match your place in the visual novel text. You can scroll back, and the sounds cue again, if you want to pinpoint when the birds stopped singing. You can replay animations as well, including a scuttling Culler and Cassie diving backward for safety. The artists' judicious use of motion elevates moments of high tension and protects this title's place in the thriller genre. I cared about every character. I simply can't pick a favorite between Wiremu the hustler and Biddy the hard-drinking old lady. Even Cassandra Winter steps up as the right protagonist for this story. She incorporates both competence and fallibility. In the opening sequence, she frames the conflict between European settlers and native lands in shades of gray. She's the right person for the job, and a credible narrator who sets the tone of the story from the get-go. If Moonlight allows you to use the clues that you pick up on to avert disaster and save lives, I haven't found it. The story is linear, albeit with minor variations based on seemingly minor dialogue choices. However, I can hardly criticize Bionic Penguin for the same narrative choice I enjoy in my favorite game. I personally find beautiful truth in inevitability, in stories where you can't save everyone, in situations where NPCs don't know they're NPCs and try to be main characters anyway. At the same time, I recognize this perspective is uncommon, and some players might find Moonlight's linearity frustrating or unsatisfying.